Thursday - April 2, 2015: I paid a second updating visit to Smokey's on the Blvd BBQ in south Overland Park. This time I sampled the burnt ends, sausage and a single pork rib. The meats have improved in the year since I last updated the review of this three year old barbecue restaurant. The smoker is no longer on a trailer in front of the restaurant and it is not clear where the smoking is now done. Tuesday - April 7, 2015: After a recommendation on the Kansas City Eats group, I revisited Szechuan Dynasty in Olathe and asked for the traditional menu. I tried the buffet at this restaurant which doesn't include dishes like this several times in the past and didn't not care much for it. There are several Chinese buffets in Olathe which I prefer to this one. I started with a dan dan noodle appetizer. The noodles are topped with mixture of chili oil, Sichuan pepper, minced pork, and scallions, garlic and ginger. I liked this dish, but would like a little higher ratio of topping to noodles. 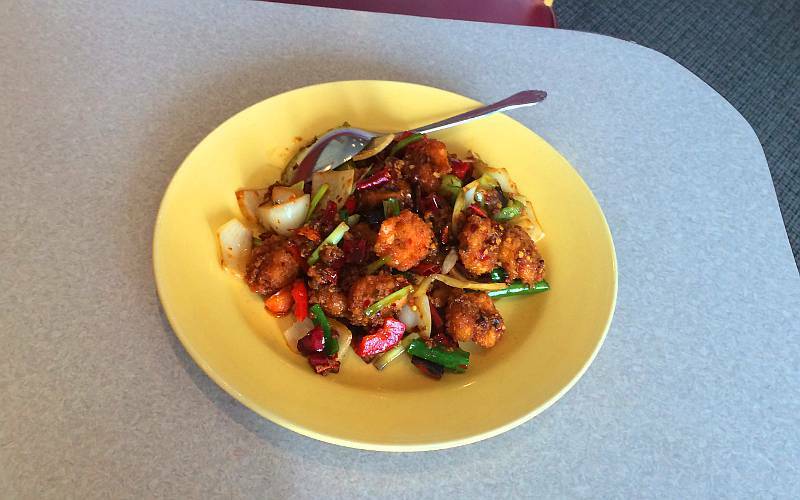 The Chung King Chili Shrimp also had the Sichuan pepper and chili oil, so the flavor was similar. In addition there was onion, celery, sweet peppers and some other hot pepper. It tasted wonderful and made my scalp sweat. This is one of the hottest dishes at Szechuan Dynasty and I would rate it somewhere around Thai medium hot. 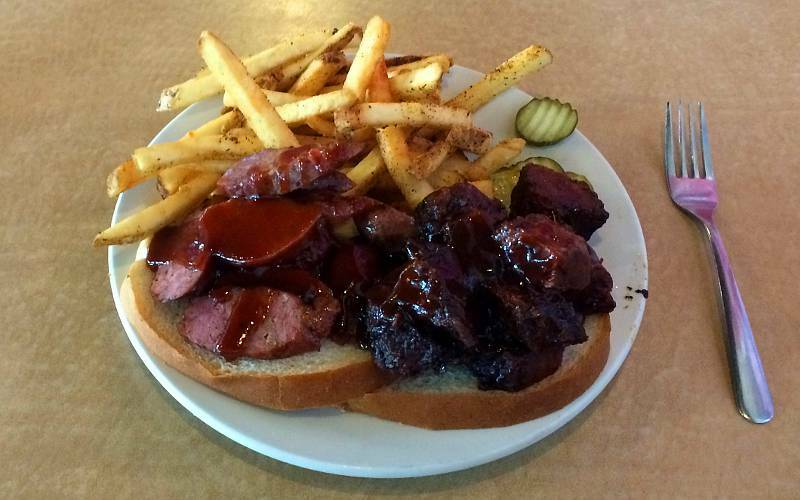 Wednesday - April 8, 2015: Today's lunch was at Jon Russell's Kansas City Barbeque in Overland Park. It has been about a year since the last visit and the restaurant has doubled in size, increasing size of the dinning room about 3 times. I feel that they have become much more polished in the past year. They now have several of the BBQ sauce flavors available for sampling, the fries are improved and the pork ribs were better than I remember. Thursday - April 9, 2015: I tried the traditional menu at Szechuan Dynasty in Olathe a second time today. 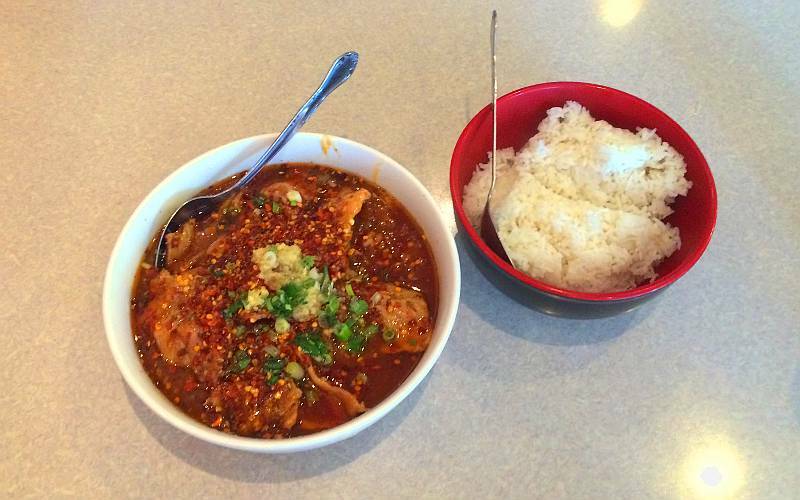 No appetizer, just the pork in Sichuan chili broth. This dish was marked with 2 peppers, same as the shrimp earlier in the week, but it was not quite as hot. I would put it closer to a Thai mild, but that would still seem very spicy to many diners. The serving was huge and could easily have served two people, but it was good enough that I still ate almost all of it. After two tries, I like the Szechuan Dynasty traditional dishes a lot. There is a bit of an aftertaste that isn't exactly what I would choose. I assume it is from the Sichuan pepper and I hope to become more accustomed to it after a few more meals. Friday - April 10, 2015: Mary, Linda and Nick helped me check out Antojitos del Perú in Lenexa. It had been a little difficult learning details about this two year old restaurant. When it first opened, it shared the space with a coffee house called Happy-X. 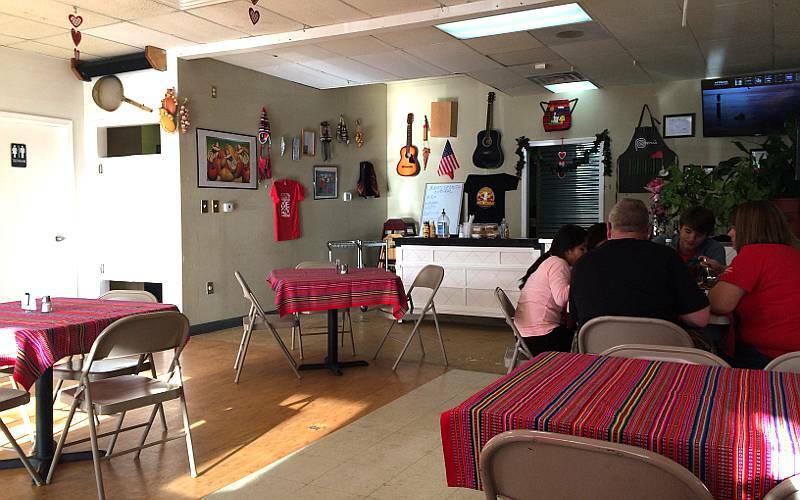 The coffee house operated in the space Monday - Thursday and the Peruvian restaurant operated on Friday - Sunday. Now it is just Peruvian and is open Tuesday through Sunday. A number of the dishes on the main menu are only available on Saturday & Sunday, but there was a second smaller list of items available on weekdays. We sampled two fried seafood dishes, steak and pork. They were all good, but none so special that this small restaurant will go on our Unique Kansas Restaurants page, so I won't bother describing the dishes at great length. The tables and booths were a bit cramped, though I did appreciate that the booths had been made by the man who had operated the coffee house. 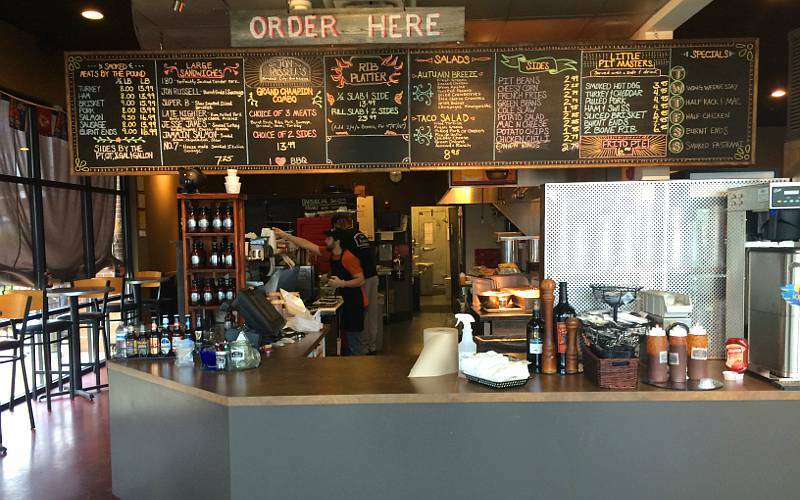 Saturday - April 11, 2015: Q39 is a barbeque restaurant on 39th street in Kansas City, Missouri. We tried it out a few months after it opened opened last spring. It has been getting more press lately and we decided to give it a second try. The dining room is designed to noisy and the noise level made it hard to have a conversation. 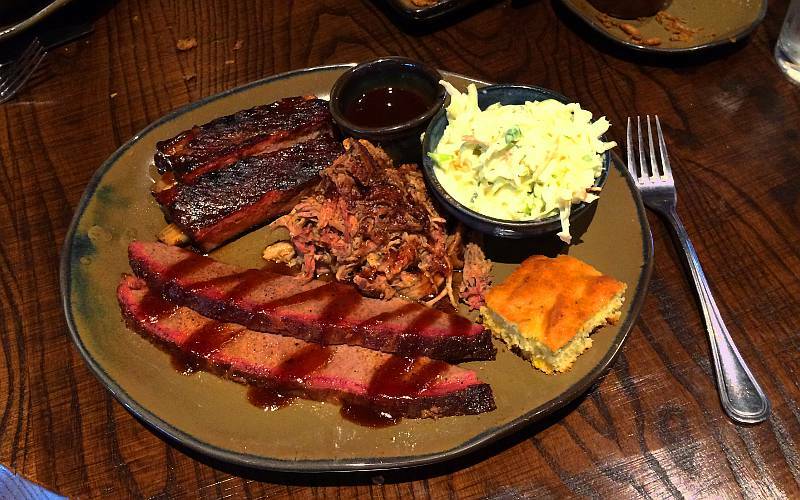 We tried the smoked pulled pork, brisket, honey glazed pork ribs and the smoked & grilled chicken. The pulled pork and ribs were our favorites, but the ribs were trimmed and cut down to the point that there wasn't much meat on a rib. The spice on the spicy onion straws didn't quite work for me, but dipping them in the sauce which came with them (and probably had much the same spices) made them very good. The brisket looked good, but was dry and had little flavor.